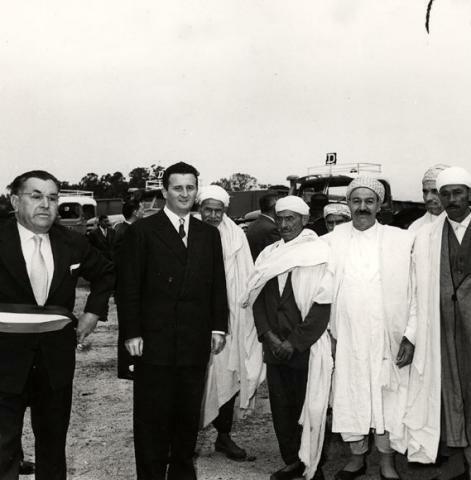 Laying of the first stone of the Berliet plant at Rouïba in Algeria. In the 1950s, Paul Berliet was trying to develop his international presence. So it was in 1957 that he set up a subsidiary: the Société Africaine des Automobiles Marius Berliet (SADAB) and undertook the construction of a first factory in Rouïba-Reghaia 27 km from Algiers. The objective was to be able to fulfil the high demand for Berliet trucks, which at that time represented more than 70% of HGVs in Algeria, and equally to be able to provide for their maintenance closer to the end user. One year after the commencement of work in the presence of the local authorities, the plant was operational on a surface covering 22,000 square metres. The first truck to be assembled there rolled off the line. A second plant was built alongside the first a few months later. Dedicated to the assembly of long-distance buses, it was also a huge repair and spare parts centre making it 'the largest garage of the world'. In 1960, the site employed 500 people of whom 80% were Algerians. In 1962, 5000 trucks rolled out of these factories. Book : Monique Chapelle, Berliet, EMCC, 2009.